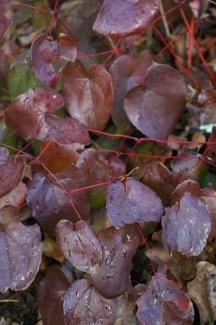 Joy Creek Photo Archive (c) all rights reserved When we first planted Epimedium 'Black Sea', we wondered how it got its name. It wasn't until the autumn of that year that we began to understand as the evergreen leaves changed from glossy blue green to purple black. This is a dramatic change. The winter foliage holds so attractively on its red stems that we hesitate to cut it back in February when we know we should to allow the flowering stems and then the new foliage to emerge. We wish that we could delay the cut-back because the pale flowers would look lovely against that dark foliage. If only! But then we see the airy flower stems bearing their small, delicate flowers of soft yellow inner sepals topped with pinkish outer sepals and we find yet another pleasure in this sturdy groundcover.